Last year, LG created the G2 with a big screen, striking design and a bunch of innovations. Now, with the G3, LG aims to change things again with a display that's unprecedentedly high resolution, a striking new OS design and a great camera - with laser-guided autofocus no less. Is this the most advanced phone yet? Read on. Here's the thing: there are flagship phones with big screens. They've been getting bigger over the last few years, including the likes of the Samsung Galaxy S5, Huawei Ascend P7 and the G3's predecessor, the LG G2. 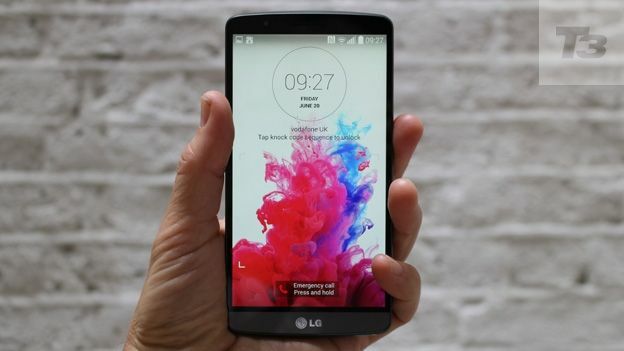 But the LG G3 has a bigger display - 5.5 inches - than many phablets. Frankly, human evolution needs a speed bump to help our hands keep up. Still, LG says the key feature with this phone is that it's refreshingly simple to use. Last year, LG introduced its one-button design. In the middle of the back sits a power button flanked by volume rockers above and below. And that's it. No home button, no camera trigger, nothing else. While it's still a bit fiddly to get used to turning the phone off or dim the screen at the back, and though we still fear accidentally hanging up on a call if our finger rests in just the wrong place, the one-button thing is more familiar now. LG has created an excellent screen wake-up system in KnockOn: rhythmic taps in different quarters of the screen guide you through security to the home page. So you can start using the phone without picking it up or without reaching all the way to the edge for a conventional power switch. But to turn it off you either have to wait for the screen time-out to kick in or reach behind the display for that physical button, and that's not as convenient. Ah well, when you've woken the screen you'll want to look at it. Because this display has a preposterous number of pixels - 1,440 x 2,560 - which works out at 538 pixels per inch. Seriously, we're not even sure our eyes are up to this. When Apple launched its Retina display on the iPhone 4, it looked astonishing. This looks even better but the truth is we're now getting into territory where continued increases in resolution provide only tiny increases in discernible quality rather than the step change that Retina display delivered. But this is undoubtedly a great-looking screen, with subtle, gentle colours that aren't over-saturated. They look natural and realistic. And the benefit of a screen this ridiculously sharp is that text gleams. Take the pre-loaded video, a series of still panoramas, which has the tiniest captions imaginable: every letter is pristine and readable. Other premium phones like the Samsung Galaxy S5 and HTC One M8 score highly for their displays and, honestly, there's precious little between them. Even so, this is gorgeous. The bezel at the sides is very narrow indeed, so the 5.5-inch display takes up almost the entire width of the phone, making it as comfortable in the hand as possible. Though, oh boy, it's still a palm-stretcher, and noticeably bigger than the Samsung Galaxy S5, for instance, and the curved back isn't enough to make this phone comfy in the hand. The design on the G2 has been enhanced, too. This isn't a unibody - the back cover and even the battery are removable - but it's a well-built phone with no noticeable creaking as you flex it in your hands. The rear of the phone has that power button and rocker switch, with a big camera lens above. To one side is the flash which, like the iPhone 5s has two lights in it to create a more natural effect. To the other side of the lens is a dark oval. This is that Bond villain-sounding feature, the laser- guided autofocus. Don't worry, the camera laser won't blind you: it's there to offer focus at under 300 milliseconds. That's faster than it takes to blink. Whatever, this is noticeably a super-fast camera. The metallic-effect back is classy and attractive, quite like the HTC One M8. Although, let's remember the HTC has a real metal back. The plastic casing here, though not as classy as HTC's, means it's possible to plonk the LG G3 on a wireless charging dock - you can't do that with a metal phone. The phone weighs in at 149g and measure 8.9 mm thick. LG has refreshed the way the phone's OS looks. Ever since Apple plumped for a layered look - flatter, some would say - there's been a fashion for 2D rather than faux 3D effects. That's the case here and it looks elegant and simple. LG has also consciously reduced the amount of bloatware that's pre-loaded on the phone. It's all part of the company's determination to make this a simpler experience, and it's certainly welcome. Though the first of the three home pages when you start using the phone isn't the Flipboard style magazine favoured by Samsung and HTC. Instead it's a screen devoted to two items. One is LG Health. No surprise as health is such a hot-button item at the moment, and it helps you set up a fairly comprehensive fitness app. And the other is Smart Tips, a useful link to make the most of the camera and Knock Code, the excellent screen security feature. The display is divided into four and you tap between three and eight times wherever you please. Only then will the phone unlock and, neatly, to reset the phone you must enter your Knock Code as well. The phone also has a content lock to keep files private and a Kill Switch to remotely wipe the G3. LG has also introduced Smart Notice which aims to be like Google Now, offering information before you ask for it, like the perfect butler anticipating your needs before you do. The most useful parts are ones based on board the phone, like a reminder to return a call you declined earlier. This is genuinely good stuff. The camera is strong. Not just because the laser focusing system is definitely fast, but because the sensor has been optimised and teamed with a decent optical image stabilisation system to make images sharper, even in low light situations. The 13-megapixel sensor is capable of really striking shots. And it does that other popular imaging thing: it shoots video in 4K resolution. It's still hard to know just how good the footage is as it's so rare to see it played back easily. But it looks like dynamite on this screen at least. What leading cameraphone wouldn't have a selfie innovation? Here, you turn on the front-facing 2.1MP snapper and hold up your hand. Clench your fist and the countdown to selfie snap begins. Simple but effective. The LG G3 has a powerful processor - but you might worry that it won't be able to keep up with the extra demands of a bigger screen with so many more pixels to attend to. In practice, there's no issue here. The phone works well, from smooth video playback to speedy photo-taking. Battery life is another concern with a big, demanding display like this but the G3 lasts a full day without too much trouble, even though the cell is no bigger than last year's model. LG claims that advanced software adapts the display to save energy, making it significantly more efficient. So is this the perfect phone? It's certainly the most powerful on the market at the moment and like Samsung did with the Galaxy S5, LG has focused on the basics rather than chucking exotic extra hardware features in for their own sake. Apart of course from that attention-grabbing laser. And it's a real pleasure to use the G3. Its size will be the clincher, though. Your mitts will decide whether it's a great development in rightfully big-scale technology or else an absurdly oversized whale.